When you’re shopping for a 2018 Mercedes-Benz GLE 350, you’re moving into the big-time of luxury SUVs. From the styling and performance, to the luxurious and convenient extras, the people at Mercedes-Benz left nothing to chance with the GLE 350. Before you go for a test drive at your local Mercedes-Benz dealer in San Antonio, TX, here are some of the unique features you can expect to find. While great performance is to be expected when it comes to Mercedes-Benz, it’s still surprising that a vehicle this grand can perform this well on the road. You almost forget you’re in a luxury SUV until you put it through its paces. Also, this is a working truck when you need it, with the ability to tow an extraordinary 7,200 pounds. It might be time to take a look at that boat you’ve always wanted. As beautiful an interior as you’ll find in its class, the GLE 350 comes in several trims, so options abound. Some of the delights include a 10-way power driver seat (with programmable lumbar adjustments and memory), a rearview camera, a warning system for forward collisions, and optional blind spot monitoring, a lane departure warning system, and automated parking. There are more options, but we lack the bandwidth here to mention them all. Whatever happens, make sure you get the two-pane panoramic sunroof. It’s a keeper. As usual, Mercedes-Benz will not short you when it comes to the electronics. The first thing you’ll notice is the Mercedes-Benz COMAND® electronics interface, complete with 8-inch display and options like a navigation system, Android Auto and Apple CarPlay, smartphone integration, and a 14-speaker *harman/kardon® sound system that is not to be trifled with. For further electronics powering and integration, there are 2 USB ports, and an optional 115-volt household power outlet. If you’ve ever wanted to run a hair dryer in a car, now’s your chance. The GLE 350 is the SUV of choice if you want to road-trip in style. With two rows of seats instead of the three rows of some other SUVs, there’s more space to stretch out for the people in back. With the climate control three-zone system, even the fussiest passengers will find a way to get comfortable. Also, added touches like rear window sunshades, a fold-down rear-center armrest, interior ambient lighting, and illuminated doorsills will make your passengers feel like they’re relaxing in a comfy lounge somewhere instead of heading down the highway at 70 mph on the way to Austin. 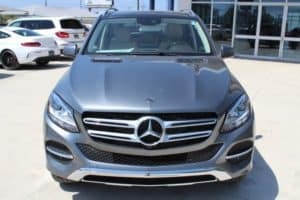 With so many fun extras, and all the luxurious options available, when you go looking for your own Mercedes-Benz for sale in San Antonio, TX, you’re certain to find just the right Mercedes-Benz GLE 350 for you.